The moment I typed the heading 'communityship' the spellchecker highlighted that there was no such word. It is in a way correct. It is refreshingly new. I came across it when reading the inspiring book, Simply Managing by one of my all-time favourites, Henry Mintzberg. Today's column is an elaboration of it in relation to the Sri Lankan context. Living in communities is nothing new for those in the East and the West. We have Sangha societies in the Buddhist context. We also have monasteries in the Christian context. The commonality in both is the way a group of members a community live. It involves sharing of a common set of values, respecting one another and a high degree of collaboration. It also invites the members to display synergy in their actions and reactions. "We need to rethink management and organisation, beyond leadership to communityship, by realising how simple, natural and healthy they can be," says Henry Mintzberg in the concluding sentence in his seminal book Simply Managing. "It seems that we are over-led and under-managed," says Mintzberg. Many may disagree. Yet, you cannot undermine this candid Canadian veteran. Having contributed to management in proposing ten key managerial roles way back in 1971, he is sharp and sensible in his criticism. I had this confusion early in my management teaching stages about the real difference between a manager and a leader, and in a broad sense management and leadership. Thanks to global thought leaders, I now have a clear way out. For me, management is a process and leadership is a phenomena. Every manager has a 'leading' function to perform. When it expands, he or she thinks and acts more as a leader. Mintzberg invites us to go even beyond. In his website blog (www.mintzberg.org), Mintzberg elaborates what he says. "How can you recognize communityship? That's easy. You find it when you walk into an organisation and are struck by the energy in the place, the personal commitment of the people and their collective engagement in what they are doing. There is a clear invitation to shift from a 'one man show' to a 'one team show'. In other words, we need not one superstar but a galaxy of superstars. I have been sub-consciously promoting this at the Postgraduate Institute of Management, and now I am more convinced when I hear the inspirational ideas from Mintzberg. In creating the communityship experience in a workplace, managers have a vital role to play. Mintzberg highlights management as a practice involving art, science and craft. I attempted to reflect more on this and to elaborate further. Figure 1 contains the details. 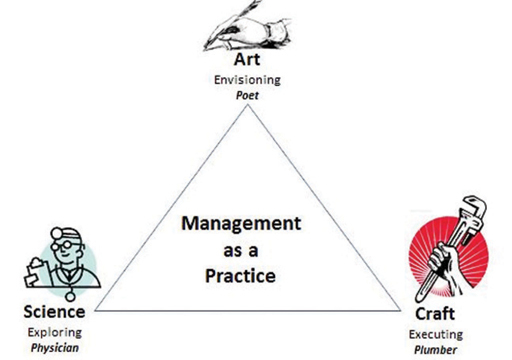 It is interesting to identify manager as a poet, physician and a plumber, to use three simple metaphors. He or she has to engage in envisioning, exploring and executing. As a poet, a manager can create a vision for future, displaying his or her leadership qualities. As a physician, he or she can analyse, diagnose, resolve and do many other tasks in exploring a scenario. As a plumber, he or she can attend to operational issues that need immediate attention, in fixing things and in executing. One key feature in communityship is synergy. Synergy is all about working together. It is synchronised energy in action. Stephen Covey, in his bestseller 'Seven habits of highly effective people', describes synergy as follows: "Synergy means that the whole is greater than the sum of its parts. It shows that the relationship, which the parts have to each other, is a part in and of itself. It is not only a part, but also the most catalytic, the most empowering, the most unifying, and the most exciting part." "Synergy is everywhere in nature. If two plants are placed close together for growth, the roots improve the quality of the soil so that both plants will grow better than if they were separated. In short, one plus one equals three or more. The challenge is to apply the principles of creative co-operation, which we learn from nature, in our social interactions... The essence of synergy is to value differences - to respect them, to build on strengths, to compensate for weaknesses". There is much food for thought indeed. A renowned American author, Mary Austin said, "Probably we never fully credit the interdependence of wild creatures, and their cognizance of the affairs of their own kind." The way geese fly in 'V' shape and the way wolves run as a flock are just two prominent examples. Synergy we see in nature is associated with the complex term symbiosis. It is close and often long-term interaction between two or more biological species. In other words, a close prolonged association between two or more organisms of different species that may benefit each member. Way back in 1877, Albert Bernhard Frank used the word symbiosis to describe the mutualistic relationship in lichens. It is also described as the living together of two dissimilar organisms, as in mutualism, commensalism, or parasitism. The term, 'symbiotic relationship' is often used in the area of sociology. The word symbiosis was first used to describe people living together in a community. It is, in fact, a true adaptation from the biological meaning of 'living together unlike organisms'. Synergy is associated with working together. Teams and groups are often inter-changeably used to describe a set of people working together. In perusing the literature of Organisational Behaviour, veterans such as Stephen Robbins and Fred Luthans have identified a group as a set of two or more people interacting and inter-dependent on each other in achieving a common objective. A team is one step ahead. I would simplify a team as a group with synergy. Communityship can be viewed as a way the East and the West meet together. It's practical nature and productive features should motivate us to embrace it as a surefire way of achieving sustained results. Sri Lankan managers should relate, reflect and reinforce how they act, react and interact in fostering communityship.